It was all about the chip. One hundred and twenty minutes plus penalties, and it was one nudge, one impudent scoop, restrained in economy, expansive in affect that encapsulated Italy's total dominance over England. 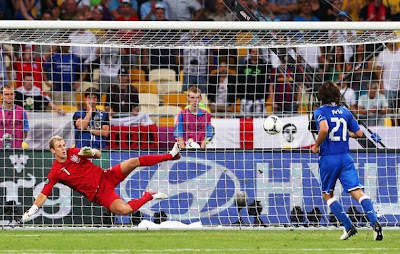 When England goalkeeper Joe Hart sprawled across, watching the ball agonizingly sail past him, Andrea Pirlo had punctuated the penalty shoot out with an ellipsis. What he did was simply ineffable. "Maybe my penalty put pressure on them," said Pirlo, with the same understatement as his penalty. It did. It shattered England, and it made Hart's antics to put off Italy's penalty takers seem like he was mentally ill. The two Ashleys, Young and Cole, could not follow up Pirlo's virtuoso act even with a competent one. It was men against boys, weak-mindedness against cerebral force. It would have been a travesty had Italy lost the penalty shoot-out. Before the game, a conspicuous portion of English opinion had predicted Roy's Boys to edge through somehow. This team worked together, for each other, for a purpose, we were told. Their flaws become their strengths, you see. Their sum is much greater than their parts. Sure, they didn't have the greatest midfield, and sure they hadn't performed coherently once this tournament, but they knew how to get results. It was all pathetically wrong. Italy came at England in waves, passing the ball around--yes, around them, about them, and through them. Blue shirts swirled around white ones like winding patterns of ink. At times it was embarrassing. The statistics make for crushing reading for England. Italy had 68% of possession and 36 goal attempts to England's 9. A country whose punditry devotes a good chunk of its time denigrating defensive football that seems, to them at least, to be the sole preserve of Italian football, played not defensive football, but no football at all. It was a cipher performance. Glenn Johnson's almost-goal in the first few exchanges receded into distant memory as Italy took ownership of the Olympic Stadium's real estate. Somehow, however, like his players, Roy Hodgson completely misread the game. Unrestrained in his delusion, he said England had been "heroic." Misreading is one thing--this is downright illiteracy. Yet, Italy do have some things to sort out. Daniele De Rossi's curving shot that hit the post, his subsequent near-miss, Mario Balotelli's inability to pull the trigger, and Riccardo Montolivo's huge miss in front of a gaping goal should have crowned Italy's approach-play. It didn't, and that, amid all this euphoria, is a concern going into the semi-final against Germany on Thursday. How Italy would love a Christian Vieri or Filippo Inzaghi right now. For now, though, it is time to celebrate. It is time to celebrate Pirlo and Gianluigi Buffon, whose save on Ashley Cole twisted the dagger that Pirlo had initially sunk. It is time to celebrate Alessandro Diamanti, a model of serenity before the clinching penalty. It is time to celebrate coach Cesare Prandelli, who believed in this team, and who remains self-effacing as ever. It is time to celberate Gli Azzurri. Great post. Love your writing style and word choice. Will definitely be sharing this as THE article that sums up Italy's win over England. Much appreciated Chris. Visit often...I will have an archive page up soon also. Thanks again! Hmmm...tough to say...I want Diamanti to stat, but how often is it the case that a player does well off the bench but fails to impress from the outset of a game? Good one - reflecting the status of italian and england football in terms of prowess,tactics and strength.. Huge Italy fan here! I could not have expressed it more perfectly. 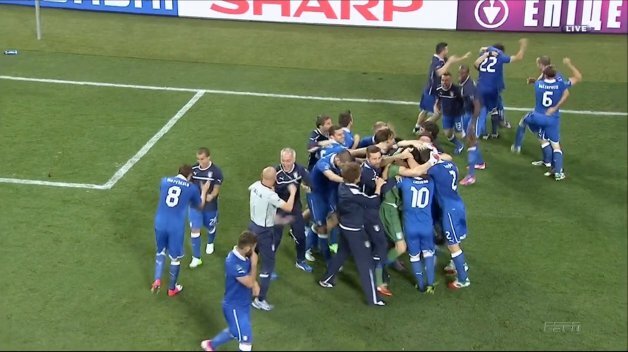 Pirlo's chip shot was the reason they won that penalty shoot out. So many games are decided by one moment where a ball squeaks in the net and finished 1-0. For some reason, Italy did not find that moment despite chance after chance. But they utterly dominated that game. England's effort was poor. They just threw themselves at the ball in the box. It worked but it was not good soccer. Yep...absolutely right. That was a psychological blow from which they could not and did not recover. It reminded me of what Ricardo did for Portugal against England in the penalty shoot-out--not a chip shot, but taking his gloves off to give his team the psychological edge. Very excited for what lies ahead...thank you for the comment!